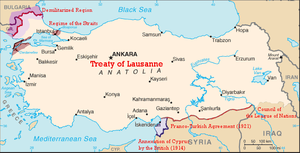 The Treaty of Lausanne was a peace treaty signed in Lausanne, Switzerland on July 24, 1923, that settled the Anatolian and East Thracian parts of the partitioning of the Ottoman Empire. The treaty of Lausanne was ratified by the Greek government on February 11, 1924, by the Turkish government on March 31, 1924, and by the governments of Great Britain, Italy and Japan on August 6, 1924. It was registered in the League of Nations Treaty Series on September 5, 1924. The Treaty of Lausanne superseded the Treaty of Sx�vres which was signed by representatives of the Ottoman Empire. The treaty was the consequence of the Turkish War of Independence between the Allies of World War I and the Ankara-based Grand National Assembly of Turkey (Turkish national movement) led by Mustafa Kemal Atatx�rk. The treaty also led to the international recognition of the sovereignty of the new Republic of Turkey as the successor state of the defunct Ottoman Empire. Picture - Borders of Turkey according to the Treaty of Sx�vres (1920) which was annulled and replaced by the Treaty of Lausanne (1923) as a consequence of the Turkish War of Independence led by Mustafa Kemal Atatx�rk. After the destruction of the Greek forces in Asia Minor and the expulsion of Ottoman sultan by the Turkish army under the command of Mustafa Kemal Atatx�rk, the Ankara-based government of the Turkish national movement ie. Turkey, rejected the Treaty of Sx�vres that was signed by the Ottoman Empire. Negotiations were undertaken during the Conference of Lausanne at which İsmet İnx�nx� was the chief negotiator for Turkey. Lord Curzon, the British Foreign Secretary of that time, was the chief negotiator for the Allies, while Eleftherios Venizelos negotiated on behalf of Greece. The negotiations took many months. On November 20, 1922, the peace conference was opened and after strenuous debate was interrupted by Turkish protest on February 4, 1923. After reopening again on April 23, and following more protests by the Turks and tense debates, the treaty was signed on July 24 as a result of eight months of arduous negotiation. The delegation on behalf of the Allies included negotiators such as the U.S. Admiral Mark L. Bristol, who served as the United States High Commissioner and championed Turkish efforts. The treaty provided for the independence of the Republic of Turkey but also for the protection of the Greek Orthodox Christian minority in Turkey and the Muslim minority in Greece. However, most of the Christian population of Turkey and the Turkish population of Greece had already been deported under the earlier Convention Concerning the Exchange of Greek and Turkish Populations signed by Greece and Turkey. Only the Greeks of Constantinople, Imbros and Tenedos were excluded (about 270,000 at that time), and the Muslim population of Western Thrace (about 129,120 in 1923.) Article 14 of the treaty granted the islands of Gx�kx�eada and Bozcaada "special administrative organisation", a right that was revoked by the Turkish government on February 17, 1926. The Republic of Turkey also formally accepted the loss of Cyprus (which was leased to the British Empire following the Congress of Berlin in 1878, but de jure remained an Ottoman territory until World War I) as well as Egypt and Sudan (which were occupied by British forces with the pretext of "putting down the Urabi Revolt and restoring order" in 1882, but de jure remained Ottoman territories until World War I) to the British Empire, which had unilaterally annexed them on November 5, 1914. The fate of the province of Mosul was left to be determined through the League of Nations. Turkey also renounced all claims on the Dodecanese Islands, which Italy was obliged to return to Turkey according to Article 2 of the Treaty of Ouchy in 1912 (also known as the First Treaty of Lausanne (1912), as it was signed at the Ouchy Castle in Lausanne, Switzerland) following the Italo-Turkish War (1911-1912). The treaty delimited the boundaries of Greece, Bulgaria, and Turkey; formally ceded all Turkish claims on the Dodecanese Islands (Article 15); Cyprus (Article 20); Egypt and Sudan (Article 17); Syria and Iraq (Article 3); and (along with the Treaty of Ankara) settled the boundaries of the latter two nations. The territories to the south of Syria and Iraq on the Arabian Peninsula which still remained under Turkish control when the Armistice of Mudros was signed on October 30, 1918 were not explicitly identified in the text of the treaty. However, the definition of Turkey's southern border in Article 3 also meant that Turkey officially ceded them. These territories included Yemen, Asir and parts of Hejaz like the city of Medina. They were held by Turkish forces until January 23, 1919. 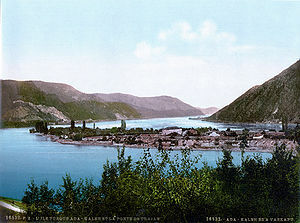 Turkey officially ceded Adakale Island in River Danube to Romania with Articles 25 and 26 of the Treaty of Lausanne; by formally recognizing the related provisions in the Treaty of Trianon of 1920. Among many agreements, there was a separate agreement with the United States: the Chester concession. The United States Senate refused to ratify the treaty, and consequently Turkey annulled the concession. The Treaty of Lausanne led to the international recognition of the sovereignty of the new Republic of Turkey as the successor state of the defunct Ottoman Empire. The Convention on the Turkish Straits lasted only thirteen years and was replaced with the Montreux Convention Regarding the Regime of the Turkish Straits in 1936. The customs limitations in the treaty were shortly reworked. Hatay Province remained a part of the French Mandate of Syria according to the Treaty of Lausanne, but in 1938 gained its independence as the Hatay State, which later joined Turkey with a referendum in 1939. Syria does not recognize the addition of Hatay Province to Turkey and continues to show it as a part of Syria on its maps. Political amnesty was applied. 150 personae non gratae of Turkey (descendants of the Ottoman dynasty) slowly acquired citizenship - the last one was in 1974.